Queso dip is one of my favorite snacks at get-togethers. I simply cannot get enough. More often or not the dip is a variation of the same recipe - much the same as my recipe, however I feel that my addition of taco meat adds a nice punch to the queso. With less than a handful of ingredients this recipe is without a doubt something even the most novice of chefs can pull off. You can vary it up as much as you want too. Like a little extra heat? Use Spicy Rotel, or throw in some chopped Jalapeños! Not a fan of meat in your dip - simply omit. I've made this as well with sausage and the results are delicious as well, I just prefer the taco meat. Bonus - this freezes really well also. Let it cool a bit and then put in freezer-weight ziplock bags and freeze until ready to use. For Serving - Tostito's Scoops are the best, in my opinion! 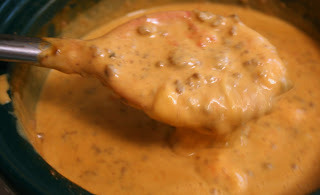 Cook ground beef or turkey in a large skillet, drain, and add 1 cup water and taco seasoning. Stir to mix and simmer until the liquid is almost completely gone. Meanwhile, dice the Velveeta in to 1" cubes. Combine cooked taco meat, Velveeta and Rotel in a large dutch oven and cook over low heat, stirring frequently until the cheese is melted and it's all combined. Serve directly from the pot, or transfer to a fondue pot or slow cooker on LOW setting and serve. I love queso, and actually have never tried/had rotel, I think it's time.